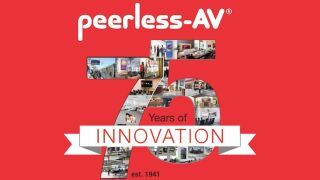 Peerless-AV is commemorating its 75th anniversary. Originally known as Peerless Industries, the company first opened its doors in 1941 in Illinois, and in honor of this milestone year, will be celebrating its decades of innovation and adherence to its core values. The company’s early innovation, the first known CRT TV wall mount, also recently celebrated its 50th anniversary. Designed for various applications, including hospitality, restaurants and bars, and home entertainment, the Model 1100 supported 17-inch and 19-inch TV sets weighing up to 60 pounds. It also featured a swivel bracket with the ability to turn 40 degrees. In the 75 years since Peerless-AV opened its doors, the company has celebrated many milestones, from extending its product line to include mounting hardware in 1978, to opening a 38,000-square-foot plant in Mexico in 1995, to launching the Jumbo 2000 mount in 1999 and the Plasma, LCD, and projector mount lines in 2003, to creating the Xtreme Outdoor Soundbar, the first powered outdoor soundbar on the market, in 2016. The year 2009 marked the launch of major developments for the company with the acquisition of BBG in the U.K. The following year, the company opened its Aurora, IL location, launched its first non-mount product (HD Flow Wireless AV System), debuted video wall mounts, and rebranded itself as Peerless-AV. In the years since, while the company continues to develop mounts, Peerless-AV has added an Emerging Technology Group (2011), launched the PeerAir (2012), acquired outdoor TV manufacturer Cill Technologies (2013), and launched a kiosk division (2014), expanding its repertoire of expertise to encompass a multitude of AV technologies. And, with 75 years under its belt, Peerless-AV is proud of its reputation for quality AV innovations. Join Peerless-AV in its celebrations on social media at facebook.com/PeerlessAV and twitter.com/PeerlessAV, and learn more about the brand at www.peerless-av.com.